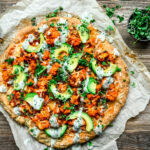 This Vegan Buffalo Cauliflower Pizza with a creamy homemade ranch drizzle and sliced avocado is the vegan comfort food of my dreams. Perfect for Friday pizza + movie night! Prepare pizza crust according to package directions. Make sure to bake the crust before adding toppings. Toss cauliflower florets in olive oil, salt and cornstarch. Spread evenly on a baking sheet and roast for 20-25 minutes, until tender and golden brown. In a small saucepan, heat buffalo sauce and vegan butter over medium-low and whisk until well combined. Remove from heat and reserve about 1/4 cup in a separate bowl. Pour the rest over the baked cauliflower and toss to combine. Spread remaining 1/4 cup of buffalo sauce over pizza crust in a thin layer. Top with vegan cheese and buffalo cauliflower. Meanwhile, whisk together all ingredients for vegan ranch. Remove pizza from oven and let cool slightly. Top with avocado slices, microgreens and a drizzle of vegan ranch. Slice and enjoy! *We use Frank’s Red Hot sauce.